To create a fun, family-friendly event that raises awareness of the role the Arts play in the physical and mental health of individuals and the community as a whole, while also raising funds to support several small arts organizations in Santa Clarita. Our mission is to build community by furthering artistic expression, participation, and appreciation for people of all ages. We envision an environment in which the Arts play an integral role in the evolving culture. Beyond its decorative and entertainment purposes, Art provides a lens through which we can reflect upon our past, understand our present, and imagine our future. Through artistic expression, artists and audiences share stories, forge connections and engage in meaningful dialogue to create a thriving, vibrant and healthy society. Our work is multi-media, multi-dimensional, multi-disciplinary and multi-generational. We strive for artistic and professional excellence. As socially conscious, responsible members of our world, we value the reuse and repurposing of previously used materials, and much of our work focuses on issues that impact our community -- locally, nationally and globally. We hope to provide an outlet for a diverse chorus of artistic voices. Did you know participation in the Arts improves both your physical health and your mental health? Playing an instrument can help Parkinson's patients maintain fine motor control, and dance or movement to music helps control tremors. Alzheimer's patients remember more while painting or listening to music. Stress, anxiety, and depression diminish when patients participate in the Arts, and healing after trauma or surgery can be enhanced by Arts participation. HIV patients show increases in critical immune system cells -- the act of writing actually impacted the cells inside the patient's body and improved their immune system. In other words, the process of creating art doesn't just make you feel better, it also creates real, physical changes inside your body. 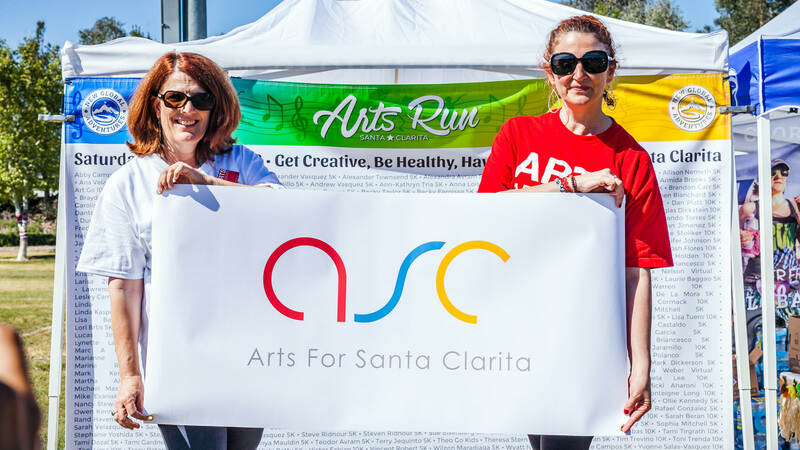 So lace up your running shoes and join us for SCV's first ever Arts Run, where runners navigate art obstacles to reach the finish line! Donate to support the Arts Run, arts programs, activities and organizations in the Santa Clarita Valley. The Arts Run is all about fundraising and creating awareness for the arts in the Santa Clarita Valley. Help us by donating more to the cause and create even better art programs in the community. Thank you for your support! Thank you for making an extra donation to support the arts, every dollar helps make a difference. PayPal is a service that enables you to pay and send money without revealing your financial details. Upon clicking the "Submit" button below you will be taken to the PayPal website to complete your registration. Upon confirmation of payment your registration entry will be confirmed.